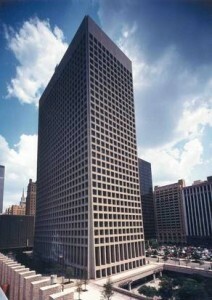 For quite some time the famous Dallas One Main Place (Its the original office towers used in the television series Dallas for JR Ewing’s office exteriors) has sat in limbo. Last week the Dallas Morning News reported that the owners of the 33-story One Main Place will indeed be converting the top 10 floors, as well as space on the lower levels, into the 323 hotel rooms and conference space. This is a much needed addition to the downtown corridor, and will create even more convention business in Dallas. This is not only important for the downtown area , but for the entire city. Convention revenue adds several million dollars to the cities economy each year, and this will undoubtably be a great addition. The owners have also said that nineteen floors (which makes up about about 600,000 square feet) will remain as office space, as well as the addition of 50,000 square feet of retail space. This will give the entire building a much needed facelift, while encouraging more retail environments in the downtown corridor. The West End welcomes this new hotel, and we look forward to watching construction begin. If you would like to see the entire Dallas Morning News Story, click here.